Bollywood Masala: Aamir Khan injured again! 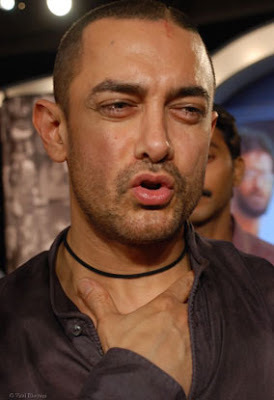 Shooting of Ghajini is temporarily halted after its leading man Aamir Khan injured his hamstring muscle yet again while shooting for the mystery thriller in Hyderabad. He is advised three weeks bed rest. The accident happened on Sunday afternoon. "It happened when we were shooting some crucial sequences with Aamir. Although he had supported his leg, he got into an awkward position while shooting and he seriously injured himself again. Shooting can wait. Right now we are worried about his well being," said director A.R. Murgadoss in a press statement.